Most remember Miss Cleo as the star of infomercials for pay-per-minute psychic phone lines. (Those who don’t can read my review of the Miss Cleo infomercial and watch the video clips at that end.) But after the “Jamaican” Miss Cleo was exposed as a Los Angeles native named “Youree Dell Harris” and her employer was shut down for unseemly business practices, she seemed to drop out of sight. So what ever happened to Miss Cleo? Miss Cleo is still speaking with a “Jamaican” accent and still claims to have mystical powers. According to the Palm Beach Post, “…she doesn’t call herself a psychic. Rather, she says, she is a voodoo priestess.” (Yeah, that makes things better.) On her website she offers various supernatural services, including Tarot readings, “energy cleansings,” and “house cleanings” (to remove disruptive spirits, not dust mites). Oh, and she also does wedding ceremonies starting at $350. 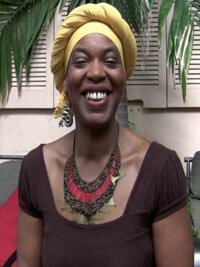 At the end of last year, Miss Cleo offered her predictions for 2009 on one of her radio shows. You can listen to the radio program for yourself. (The predictions start at the 9:45 mark.) For the most part, these predictions are vague and boring—nothing like the bold and daring psychic predictions that used to be published every year in the National Enquirer. These are more like the “predictions” at the end of each episode of The McLaughlin Group. My cousin’s friend’s grandmother went on a cruise and said the shrimp cocktail didn’t taste too fresh. That’s “some problem” but I don’t know if the ship had an Italian registry. • Mercedes will “introduce” a luxury electric car in 2009; it will be on the road no later than mid-2010. I’ll just say this once: DUH! People working in 2033 will be paying out 98.5% of their income in taxes so that all those greedy grannies get prescription drugs and luxury electric Mercedes free from the government. I’ve had Tony Danza in my celebrity death pool for years—finally it’s going to pay off! Keith Richards has actually been dead since 1997 but no one’s bothered to tell him. • Coins will be eliminated from our currency by 2011 as part of the stimulus package. Darn! That means I won’t be able to use Sacagawea dollars in the Psychic Kisok in my local shopping mall. Robert “Comrade Bob” Mugabe is the president of Zimbabwe, not Nigeria! She gave no further details on the broadcast, but an article in Boca Raton Magazine says Cleo’s show will be “about relationships and break-ups.” I can’t wait! I am getting married in October and according to her website she officiates weddings. I am looking into this immediately. Seriously, if you do get Miss Cleo to do your ceremony, we’d love to see the wedding photos! I would love to see a video and pics for your wedding if that happened. Hell I would even pay to travel to your wedding just to see it, even though I have no idea who you are. A voodoo priestess/former psychic lesbian and talk show host? You can’t write this stuff. I remember hearing about Cleo’s legal troubles with false claims during her “fee readin’s”, but I didn’t know the former psychic infomercial queen was back. Hey, at this rate, maybe former late-night fixtures like Tony Little and Jake Steinfeld (apparently the real last name of the “Body by Jake” guy/Stallone ripoff who always opened his commercials by saying “Hey gang”) can make comebacks. On her website she offers various supernatural services, including Tarot readings, “energy cleansings,” and “house cleanings” (to remove disruptive spirits, not dust mites). Does she also do “colon cleansings”? If not, she might consider horning in on Klee Irwin’s racket. Does anyone know if Ms. Cleo plans to appear in the Jerry Springer show? Drew Peterson is multiple wife murderer and former cop. I guess one of his wives was named Stacy. Scott Peterson was convicted of killing his wife Lacey here in the SF bay area. I know this because it was constantly plastered all over the friggin news here when they were searching for her. I dunno, do you think psychic voodoo hacks might have heard of the Google? “One of the cast members of the show Taxi is lost this year.”. She must have been watching a Celebrity Rehab marathon when she came up with that one. I thought this weirdo went to prison at some point for fraud?